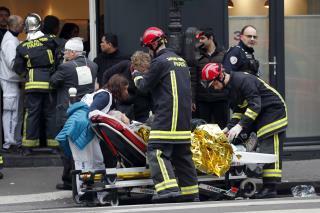 (Newser) – French authorities said two firefighters were killed and 47 people injured in a powerful explosion and fire apparently caused by a gas leak at a Paris bakery Saturday that blasted out windows and overturned cars. Firefighters pulled injured victims from windows and evacuated residents as smoke billowed over Rue de Trevise in the 9th arrondissement of north-central Paris. The Paris prosecutor's office says two firefighters were killed in the blast, correcting the figure of four dead given earlier by France's interior minister. Authorities say 10 people are in critical condition and 37 others less seriously injured, per the AP. Paris prosecutor Remy Heitz says the cause appears to be an accidental gas leak, adding that Paris firefighters were already at the scene to investigate a suspected gas leak at the bakery when the explosion happened. were there any muslims working as repairmen or bakers there? Even after you fix a gas leak, gas can still explode if not re-ignited in carefully-timed-procedure. Why didn't firefighters have a resourceful plan for turning off natural gas at a source-point? Was the entire natural gas system designed by a terrorist?